Maryland is known to be a very tenant-friendly state, with Baltimore being one of the most tenant-friendly cities. This is awesome news if you’re a renter. However, if you’re a landlord, you should read the phrase “tenant-friendly city” far differently than you would if you were scouting a place with which to sign a lease. Tenant friendliness throws a lot of precautions in the faces of property owners because, by default, renters have a lot of protections. Strong renter protections mean landlords have a lot of hoops and ladders to crawl through if they need to evict a tenant. Even if you follow every requirement to a tee—which can be incredibly difficult for individual property owners, given the complexities of the laws— you’re still probably looking at a minimum of three months to have a non-paying tenant evicted from your property. So, why does the eviction process take so long in Baltimore? Let’s take a look! If you’re like most landlords, your rent is probably due on the first of the month, but you likely give a few days’ grace period. Depending on the terms of your lease, you can file after your specified grace period has expired, or sooner if you don’t offer a grace period. In Maryland you have to wait 5 days before you are allowed to file on a tenant for failure to pay rent. This is why it’s imperative to have a properly written lease signed and on file; it’s for your protection. Before you can evict a tenant in Baltimore, you have to notify him or her that they have failed to pay rent for a given month. It’s important to do this as soon as you’re lawfully able, as the process that follows will be long enough without any additional delays. To file a failure-to-pay rent notice, you must submit a written complaint to the District Court with details such as the amount of rent due and the court costs you’re expecting the tenant to pay. The rent notice will give your renter a court date, so they can defend themselves, should they wish to do so. The court date is usually about two or three weeks out from the date of filing. Bay Management Group in Baltimore, MD files failure-to-pay notices on all tenants after the 8th of each month if a tenant hasn’t paid rent. We monitor payments scrupulously and act immediately. We appear in court on your behalf, so you don’t have to take time out of your busy day. If the judge sides in your favor, you get can what is known as a warrant of restitution, which allows you to set up a time with the sheriff to go-ahead and take back possession of the property. Once you receive the Warrant of Restitution, you have to wait about ten business days for the paperwork to be processed and sent to the sheriff’s office. When that’s in order, you can schedule a day and time to evict your tenant. In Baltimore City, you can expect an eviction date to be scheduled about 30 days out from the time the paperwork is ready. This process sounds easy on paper, but it can be frustrating for people who already have other commitments and busy lives. It often takes several phone calls before the paperwork has been processed and is in working order for an eviction. As you can see, even if you know all the channels and avenues you need to take, eviction in Baltimore is still a laborious process. If you’re trying to do it on your own, you’re going to spend hours (if not days) at the courthouse getting all of the documents prepped and sitting in the courtroom. Bay Management Group eliminates the frustration and puts time back on your clock by taking care of these tasks for you. Even if you’re successfully able to evict your tenant, you’ll be out roughly three months’ rent in a best-case scenario. Mind you, best-case scenarios can be pretty uncommon, so you may be looking at more, particularly if you try to take the process on by yourself. The missed-rent calculations are obvious, but a lot of people forget about the damage non-paying tenants can—and usually do—inflict on properties when they know they’re going to be evicted. The cost of eviction goes a lot further than the loss of rent. Once your tenant is gone, you’ll need to pay for all the fixes necessary to make your place livable again before the next tenant can move in. In some cases, repairs could cost you thousands and thousands of dollars. If you don’t already have a team of qualified professionals to help you clean up the mess, you’re looking at days or weeks of phone calls, and if you stumble upon a contractor that doesn’t live up to his or her expectations, you’ll have to hire someone else to deal with the shoddy job left by your first-choice vendor. Once the tenant is out of the property, you’ve regained possession of your space, and made the necessary fixes to get it back into a rentable condition, you’ll need to find new tenants. 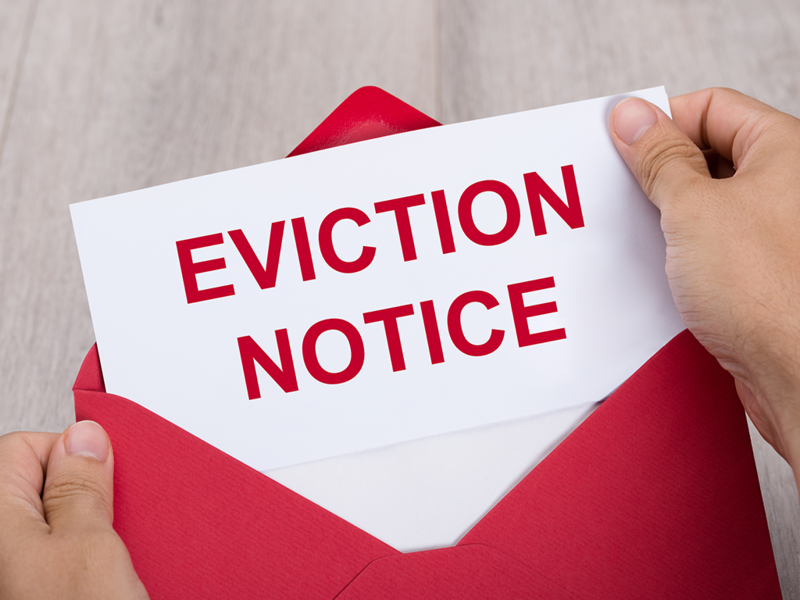 You don’t want to wind up in another eviction situation a few months down the road so you will want to be extra careful about the tenants you select. This process is seldom easy, and it’s far from quick. If you don’t already have a process in place, this part of rebuilding can get very overwhelming quite quickly. When you work with a professional property management company, these details are taken care of for you. You’ll have a team of social media experts, real estate-gurus, and experts who will present your place to proper potential candidates. In return, you can rest assured that thorough background and credit checks are done, ensuring the person who’s chosen for your property checks the boxes and meets your standards, so you can realize the benefits of being a homeowner in Baltimore. A well-written lease is your best friend when you’re a landlord in any city. But with Baltimore’s tenant-friendly practices, you really need to cover your assets. It is critically important to make sure you find quality tenants from the beginning, so you don’t have to deal with the eviction process. If you don’t have the right screening processes in place, the total cost of an eviction could exceed $10,000 in Baltimore. The eviction, repair, and re-rental processes are not only costly by themselves; they’re also time-consuming, and time costs money. Bay Management Group facilitates a reduction in evictions because we find the right people right out of the gate. Our clients’ tenants are thoroughly screened and vetted. We know when to take action, and we know how to approach eviction situations. It’s not your job to deal with the details; it’s ours. Bay Management Group is Baltimore’s solution for eviction prevention. Given our thorough pre-screening process and highly skilled property management experts, our people know how to put the right renters in your space in the first place. If we place a renter who gets evicted within the first six months, we’ll re-lease your property for free because we stand by our word. If you’re ready to realize peace and comfort with our six-month tenant warranty, reach out to our BMG Baltimore team today!